My name is Heidi Sze and I am a Dietitian and Nutritionist (with a Bachelor of Nutrition and Dietetics from Monash University). I am also a food writer and recipe developer, and have been blogging for six years at Apples Under My Bed. In my career as a Dietitian I have worked across a range of areas including hospitals, aged care, recipe development, corporate events and private practice. I started my own private practice in Mornington soon after graduating in 2008. After having a baby girl in August 2015, I took some time off and narrowed my field of practice to pre- and post-natal nutrition. Online consultations via Skype is what I am presently offering, however Dietitian and Nutritionist Emily Scott will be available for in-person consultations at the Mornington clinic on a Saturday. Emily will see a range of clients with different nutrition issues and can be contacted for appointment enquiries here. I have a passion for helping people enjoy good food. I like to encourage women to nourish ourselves so that we feel our best, to ensure we are eating without guilt and unnecessary restriction, rather with self-respect and joy. After having a baby I developed a great interest in the process of growing and nourishing a little person from within, as well as giving birth and looking after yourself + baby postpartum. I am incredibly excited to be focussing my work in this area. There’s a lot of confusion and misinformation out there regarding what a healthy diet actually looks like. The thing is, each person is different and must look within to figure out what makes them feel their best. My job is to help you identify the diet and lifestyle choices that make you thrive, and help you commit to and shape your life around those choices, so that you consistently feel your best. I provide personalised advice and ensure your diet is balanced, with the joint goal of feeling good + functioning well. I believe we need to treat ourselves with kindness, listen to our bodies and make food and lifestyle choices from a place of confidence and self-respect. This is important when wanting to live a life without fear of devouring a block of chocolate in one sitting, when wanting to eat out with friends and not label this as being "bad"... life is too short to attach guilt to moments that should be joyful. Focusing on self-care in this way is important for general wellness, in addition to encouraging optimal fertility in the preconception period. It is also important when growing a baby and caring for children. I love helping women work out how to nourish themselves best during whatever stage they are at in the broad and beautiful pre- and post-natal periods. Please see my contact page for details on booking an appointment. I look forward to hearing from you! To learn more about me, you might like to follow me on Instagram or read my food blog, Apples Under My Bed. 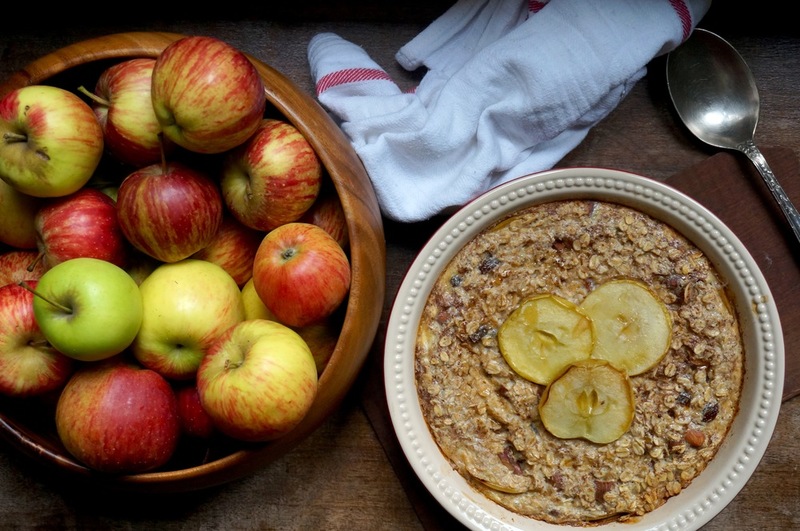 And to make the baked apple oats recipe below, follow this link.